Davidson County Chancellor Claudia C. Bonnyman was celebrated for her many years of public service by colleagues, friends, and family at a retirement reception held Tuesday at the Metropolitan Courthouse in Nashville. Chancellor Bonnyman served on the Davidson County Chancery Court for 15 years; from 2003, when she was appointed by Governor Phil Bredesen, until her recent retirement. During her judicial career, Chancellor Bonnyman won election three times, most recently in 2014. She also won the admiration of many of her peers, as was evident by the warm remarks that several judges offered at the reception. One of those judges was Chancellor Bonnyman’s colleague on the Davidson County Chancery Court, Chancellor Russell T. Perkins. 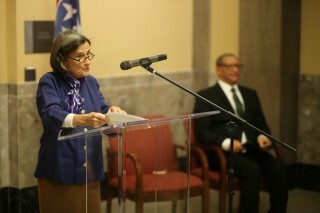 Another was United States Court of Appeals for the Sixth Circuit Senior Judge Martha Craig Daughtrey, whom Chancellor Bonnyman described as her mentor. Judge Daughtrey was Chancellor Bonnyman’s professor at Vanderbilt University Law School, and the two have remained lifelong friends. “Claudia has had a remarkable career,” Judge Daughtrey said. Tennessee Court of Appeals Judge Richard H. Dinkins recalled how he was sworn into his former position on the Davidson County Chancery Court on the same day as Chancellor Bonnyman. Once he became an appellate judge, he had the opportunity to review her opinions, which gave him an even greater appreciation for Chancellor Bonnyman’s thoughtful work. Even before she was appointed to the bench, Chancellor Bonnyman was well-acquainted with the Davidson County Chancery Court. She had served as Clerk and Master for the court starting in 1989. Before that she served as the only female Assistant District Attorney in District Attorney Tom Shriver’s office and was in private practice for a number of years as a partner with the firms Waddey and Jennings, as well as Ortale, Kelly, Herbert and Crawford. Her work was esteemed even in those earlier days of her career. In 1981, Chancellor Bonnyman was named the first president of the Lawyers’ Association for Women, an organization she helped found. When it came time for her to speak, Chancellor Bonnyman thanked many of the family members, colleagues and staff members who had helped her along the way. She also reflected on the position that she recently left. “The chancellor position is the best job in the world because the courts embody the community’s demand that we can and will reach justice when personal disputes or great societal issues arise,” she said. A number of notable figures from the Nashville area applauded Chancellor Bonnyman’s remarks in the packed wing of the Metropolitan Courthouse. They included Tennessee Supreme Court Chief Justice Jeff Bivins, Nashville Mayor David Briley, former Davidson County Chancellor and Court of Appeals Judge Ben Cantrell, former Court of Appeals Judge Patricia Cottrell, Court of Criminal Appeals Judge Timothy Easter, and former Davidson County Chancellor Carol McCoy, among others.